See that room up there? It's mine. I don't have to share with anyone except my dino pal in the back corner, Nom Chompsky. It's not that I don't like sharing (giving cookies away is one of my favorite things to do), but I really, really need my own space to retreat to at the end of the day. Knowing that no one can enter my little sanctum without permission is simply glorious. In addition to my swoon worthy solace, the kitchen is the best I've experienced in my college dorm life. If you ignore the fact that it doesn't have any windows, it actually resembles a kitchen that could be in somebody's house (I'll get a picture up on the facebooks soon). I already made a batch of good ol' chocolate chip cookies to acquaint myself with the space. I've appointed myself as its unofficial keeper. Hopefully no one brings their drunken escapades in and desecrates it. So...cookies, yes? 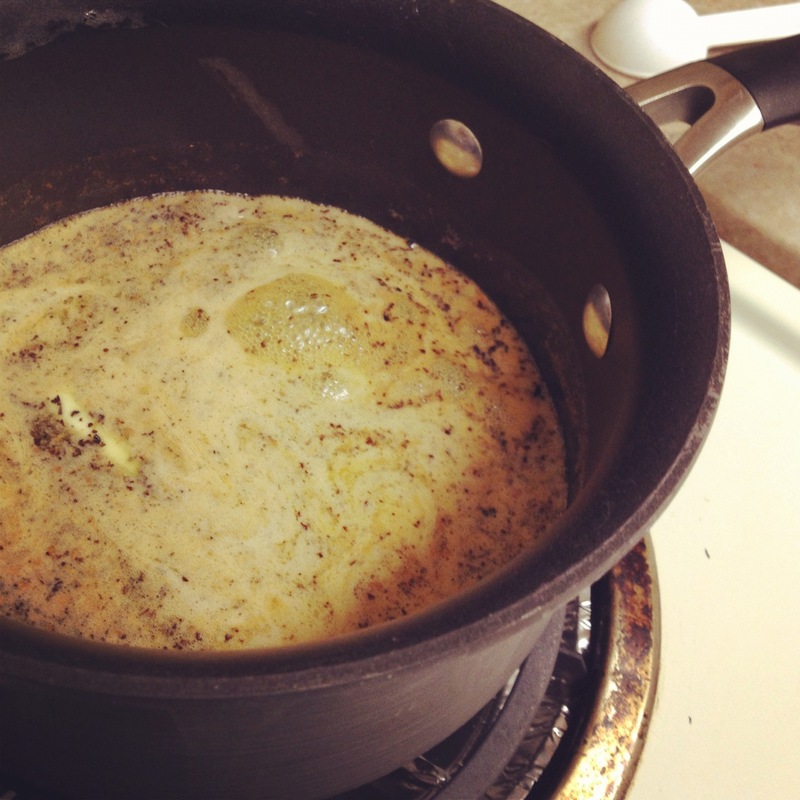 I tried to use tea infused butter in a recipe once before, and it didn't work awesomely. This did. So much. Perhaps the difference was in using significantly more tea. And using an actual tea strainer instead of trying to use a slotted spoon. Stupid idea. Anyway, the chai definitely shines through: the smell hits you first, and the warm spices linger with each bite. Someone walked by and thought I was making an apple pie. I like that. Welcome to fall, everyone. Preheat your oven to 375° F. Line a cookie sheet with parchment paper and set aside. In a large sauce pan, over medium heat, combine butter and tea. Let the butter and chai tea mingle under a low simmer for 10 minutes, until browned. Drain the chai from butter using either a french press coffee machine, a tea strainer or coffee filter. Let chai infused butter sit until it becomes solid again – do this at room temperature (okay, so I got totally tired of waiting and after I prepped all my ingredients and it was STILL a liquid, I just decided, meh, and used the liquid butter). Once the butter has become solid again, whip the butter and sugars together for two minutes, followed by the eggs and vanilla. Add dry ingredients and mix until well combined. Drop cookies in rounded tablespoons on cookie sheet and bake for 10-12 minutes. Take them out of the oven, let them sit for a few minutes before transferring to a cooling rack.